Finding favour: Customers at a Maruti TrueValue dealership. The used car market this fiscal is about 10% larger than that for new cars. New Delhi / Mumbai: Sales of used cars in India may have finally overtaken new car deals this year for the first time as higher interest rates have forced buyers to look for cheaper vehicles. While there is no accurate data on used car sales, car dealers and the country’s largest vehicle financier believe that more second-hand cars were bought and sold this year than new ones. The used car market this fiscal is about 10% more than that of new cars, according to estimates provided by Maruti Suzuki India Ltd’s TrueValue used car division, the largest organized sector company, and Honda Siel Car India Ltd’s AutoTerrace, which sells previously owned cars. Other car financiers also point to the same trend. They estimate that the used car segment is growing at 25-30% compared with 13% for the new car market. In fiscal 2007, which ended in March, Indians bought 1.4 million new cars, compared with about 1.3 million used ones in the same period, according to their estimates. It has been a different story since then. Since March, Maruti sold 65,000 used cars, an increase of 45% over a year ago, while Honda sold 2,769 used cars in this period compared with 1,765 cars a year ago. “Replacement rates are accelerating as we are getting younger cars (into the segment) and the availability of more models," said Ravi Bhatia, chief general manager (sales support) of the TrueValue division. With advances in technology and a record number of new car models entering the Indian market every year, customers typically go for an upgrade or exchange within three years of their purchase now, compared with 10-15 years previously. As many as 50 new and tweaked models have been introduced in India every year for the past couple of years, a trend that is expected to continue till at least the turn of the decade as car makers pump in Rs35,000 crore in Asia’s third largest automobile market. That compares with barely two marquees three decades ago—the Fiat Premier and Hi-ndustan Motors’ Ambassador. The 25-30% growth in the previously owned car market in the last three years has happened because interest rates for used and new vehicles are more or less the same, with the cost of financing a new car being barely 200 basis points cheaper. 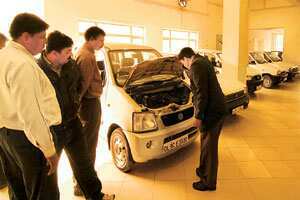 Organized players—such as Maruti’s TrueValue and Automartindia Ltd, started by the Mahindra Group—which have entered this business are also contributing to the trend as they offer buyers and sellers the assurance of proper ownership and accident documentation, quality and add-ons such as warranty and free services previously available only for new car buyers. TrueValue, for instance, reported a tripling of its inventory in the past three years to 9,000 cars. Nearly 75% of a car’s cost in India is typically financed by lenders now, compared with 90% a year ago. “With overall affordability going down, people have been shifting towards smaller and used cars," said N.R. Narayanan, group business head (vehicle loans) at ICICI Bank Ltd, India’s second largest bank by assets. “For the same EMI (equated monthly instalment), people want a car with more features." ICICI Bank is the biggest financier of vehicles in India and advances close to one-third of the Rs42,000 crore disbursed?for?buying?automobiles. The cheapest variant of Maruti Suzuki’s Alto, India’s largest selling car, costs around Rs2.38 lakh. In comparison, a used three-year-old model of the Ford Ikon, a larger car with more trunk space, is priced at Rs2.5 lakh, barely Rs12,000 more. The general consensus among the industry is that the used car segment may become almost double of the new car market in another five years as two-wheeler owners shift to four-wheelers. In markets such as the US and France, the used car segment is as much as 2.5 times larger than the new car one, said a recent report by consultancy firm Capgemini. “There are about 70 million motorcycle users in India," said Vinay Sanghi, chief executive of Automartindia Ltd, one of the first to enter this segment. “For most of them, the first car is a used car."